Mission: To protect the health of the people of Louisiana by reducing tuberculosis-related morbidity and mortality in all areas of the state through prevention, detection, treatment, and education. Our program will provide a high level of care and services based on data and evidence-based decision making. Louisiana has a centralized TB Control Program that implements TB control activities throughout the state under the direction of a Central Office and Regional Program Managers. Tuberculosis (TB) is an airborne communicable disease caused by Mycobacterium tuberculosis. While TB of the lungs (pulmonary TB) is the most common, tuberculosis can affect any organ in the body. For more information about TB listen to this four minute CDC podcast. TB is spread through infectious droplets or particles that a person with infectious TB disease can spread when he or she coughs, speaks, sneezes, laughs, or sings. Persons nearby may breathe in these particles and become infected. What is the difference between LTBI and TB disease? TB disease. Persons with LTBI are at risk for developing TB disease but do not have symptoms and cannot spread tuberculosis to others. TB Disease is when a person has a large number of M. Tuberculosis bacteria in his or her body. Once a person progresses to TB disease they can spread tuberculosis to others and will begin experiencing symptoms. Is there treatment for TB? Yes, TB is curable and preventable. There are treatment plans for LTBI and TB disease. Why is treating LTBI important? Without adequate treatment, persons with LTBI are at risk of developing TB disease. In 2018 Louisiana had 105 new cases of tuberculosis. In 2018 Louisiana dropped below the national case rate with 2.2 new cases of TB disease per 100,000 population. Are you at risk for TB? TB is spread from infectious to uninfected persons through the air by droplets that contain Mycobacterium tuberculosis. Droplets containing tuberculosis can spread when an infectious person coughs, speaks, sneezes, laughs, or sings. If an uninfected person inhales these droplets he or she is at risk of becoming infected with tuberculosis. TB is NOT spread by shaking hands or sharing food or drinks. Not all those who are exposed to a person with infectious TB will become infected. Four factors influence the transmission of TB from an infectious to an uninfected person. How infectious the TB patient is: If the infected person has been taking all medications of their TB treatment, their level of infectiousness will be lower than someone who is not being treated or is not taking the full course of their treatment. Environment where exposure occured: If the exposure occured in an enclosed area with poor ventilation, transmission is more likely than if the exposure occured in an outdoor setting with better airflow and sunlight. Frequency and duration of exposure: The more time spent with an infectious TB patient, the more likely the disease will spread to the uninfected person. Immune status of the uninfected person: If the person exposed to an infectious TB patient has a compromised immune system, potentially caused by HIV/AIDS or taking other medications that suppress the immune system, they are more likely to become infected with tuberculosis. Persons who work in congregate settings such as hospitals, nursing homes, correctional facilities, etc. Persons with latent TB infection (LTBI) are infected with tuberculosis but do not experience symptoms. Persons with TB disease will likely experience the following symptoms. TB can affect any organ in the body. Symptoms of TB in organs other than the lungs vary among patients and can mimic other infections. Persons experiencing any of these symptoms who have been exposed to a person with infectious TB should notify their nurse or physician when making an appointment. The two most common tests for TB are the tuberculin skin test and TB blood test. The skin test is commonly used by employers and schools and universities to screen for TB. The skin test involves a small injection in the forearm. Results are called "positive" depending on the amount of swelling at the injection site 48-72 hours after the injection. Most persons who are infected with TB will have a positive skin test. Testing is considered safe throughout pregnancy. What happens if you have TB? When a case of TB is reported to the Office of Public Health (OPH) TB Control Program, the first two steps are starting the patient on treatment as quickly as possible and conducting a contact investigation. A contact investigation is a process to find out if any of the patient's contacts (friends, family, co-workers, etc.) have also been infected. During contact investigations the original patient's name is not shared with the contacts being interviewed. The original patient and any contacts also determined to be infected are referred to one of the state's nine regional TB clinics. A patient and any infected contacts are never charged for TB clinic services. Treatments are available for LTBI and TB disease. Directly observed therapy (DOT) is the standard of care for all TB cases in Louisiana. DOT ensures patients take all doses of their TB treatment regimen by having a health care provider observe the patient taking their medication. During a DOT visit, the health care worker also monitors the patient's response to treatment. DOT can be done in a healthcare facility, the patient's home, or another location agreed upon by the patient and the health care worker. Standard treatment for LTBI lasts 6 months and is comprised of one drug. Standard treatment for TB disease lasts 6-9 months and is initially comprised of four drugs. Treatment plans can vary if the patient is a young child, has a co-infection such as HIV, or other medical conditions. Treatment for persons with drug-resistant TB disease is significantly longer than standard treatment regimens. Testing is done before treatment starts to determine if the disease is resistant to any of the standard TB medications. In the event of resistance, the use of second-line drugs are initiated. Inadequate treatment or lack of adherence to medications can lead to continued infectiousness and transmission, emergence of drug-resistance, or recurrent disease. 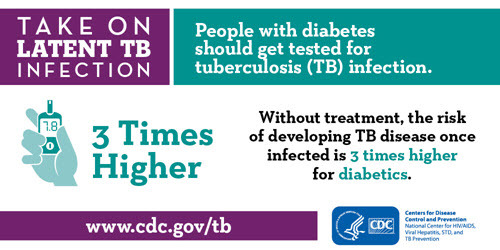 For more information about LTBI and TB disease treatment plans see the Louisiana TB Manual or visit https://www.cdc.gov/tb/topic/treatment/tbdisease.htm. There are two ways a person can come to have drug-resistant TB. Drug resistance can make the course of treatment for TB more complicated and longer in duration. This is why DOT is the standard of care for all TB cases in Louisiana. DOT helps prevent incomplete treatment, which helps prevent acquired resistance. TB is still a public health threat. While the number of cases has decreased over the past few years, it is important to keep TB in mind when diagnosing patients with TB symptoms. Tuberculosis is a Class B reportable disease. Health care practitioners who diagnose active TB are required to report the case to the Louisiana Office of Public Health within one business day of the diagnosis. For more information on how OPH and practicing physicians work together on TB cases, see the aricle, "Is It Tuberculosis" from the Louisiana Morbidity Report.